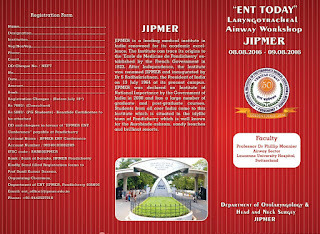 Otolaryngology Update: “ENT Today” at JIPMER on 8th & 9th August 2016. The department of ENT JIPMER Pondicherry is conducting a two day live surgery Workshop- “ENT Today” at JIPMER on 8th & 9th August 2016. I would like to invite you to participate in this live surgery workshop where we plan to showcase the surgery On laryngo-tracheal airway. Registration fee : Consultant: Rs 5000/-, PG Student: Rs 3500/- Demand draft /Multicity cheques / NEFT in favour of “JIPMER ENT Conference”, Account number: 98340100002889, IFSC Code: DARB0JIPMER, Bank of Baroda, JIPMER Pondicherry Branch.